Beautiful and perfect mix of colors to find other accent pieces for my new Florida Room. Great quality and corners stay perfectly flat, which was one of my fears before buying. 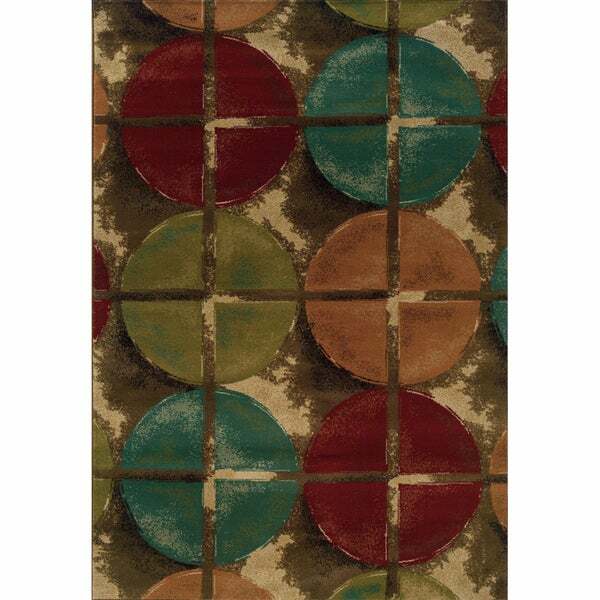 A beautiful, transitional design highlights this area rug in bright shades of brown, teal, red, beige and orange. Featuring a durable yet soft polypropylene construction this beautiful rug will make a wonderful addition to any room. Dimensions 155.91 In. X 120.08 In. X 0.32 In. I unrolled the rug and weighted down the curled end with a variety of objects for the period of about a week. There was a smell of formaldehyde or something similar that permeated the house for a few days. that's gone now and the rung is hugging the floor from one end to the next. The feel is wonderful - I find the cat sleeping on it a lot- and the colors as rich as you would expect from the photo. I'm using it with a living room suite of neutral tones. I purchased both teal and brick colors in draperies and chose to use the teal first. I'm thrilled! Very happy with the size, color and quality of this great area rug. Lovely rug but won't stay put! This is a beautiful area rug and it matches my decor perfectly. However, you should be aware that if you are using this on carpet. It definitely slides and the corners curl up slightly. We have attempted to use products to keep the rug in place, but it is still a struggle. The rug also wrinkles. We've had it about 6 months and will likely replace it in the next few months. This is a very nice rug. I loved the colors because they were bright and vibrant. Size was nice and just what I was looking for. I have purchased a few rugs from Overstock and have never been disappointed. The quality is always nice and the rugs come well packaged. I will continue to order from Overstock!!!!!!! I like the colors of the rug. Look better in person than online. Rug is soft to walk on. I would recommend to a friend. Very good price. Beautiful rug. Colors true to picture. Arrived with some fraying on one edge, but was fairly easy to fix and difficult to notice now. Needs the felt pad underneath. I love this. The colors are beautiful, I wish I had another one like it. Looks better than the picture. The quality is excellent and the colors are gorgeous. Will be perfect for my use. This was a beautiful rug, but I ended up sending it back because it was a little too structured of a pattern for me - that is an issue with me, not the product. Great rug. It fit right in with the decor. It looks nice. A little thinner than expected. It has held up well. Colors are perfect for my home...tans and browns, but will also lend some new colors for painting and accent walls. The colors as pictured are happy bright colors for my daughter's bedroom. The colors look very vibrant and I think imma bring out my Brown sectional immensely. "What is the size of this rug?" Thank you for your inquiry. If you click on the select an option drop down menu in the top right corner it will show you the sizes we have available as well as the current price we are offering them at. "Does this rug have bound edges and a jute backing?" Thank you for your inquiry. Yes this rug is bound and serged around the edges and is machine woven out of polypropylene on a jute and polyester backing (warp and weft). Home Dynamix Premium Collection Contemporary Accent Rug (3'7" X 5'2") - 3'11" x 5'3"